Many Neo-Pagans call themselves “Pagan” without the Neo- prefix. However, “Pagan” is an umbrella term which includes Neo-Pagans as well as many other kinds of Pagans. Neo-Paganism refers specifically to “earth-centered” Paganism. All Neo-Pagans are Pagan, but not all Pagans are Neo-Pagan. 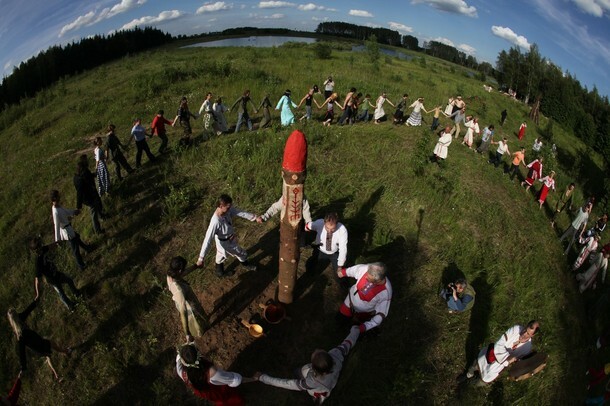 Neo-Paganism is one form of contemporary Paganism grouped under what is sometimes called the “Pagan Umbrella”. Contemporary Pagans are a diverse group with varied beliefs and practices which includes Neo-Pagans, feminist witches, Pagan reconstructionists, devotional polytheists, occultists, and many more. What most contemporary Pagans have in common is that they look to ancient pagan religions and contemporary non-monotheistic religions (like Hinduism and the African diasporic religions) for religious inspiration. How they make use of these sources varies considerably. “Neo-Pagan” is an inclusive term. It includes many Wiccans, witches, druids, shamans, animists, Goddess worshipers, religious humanists, and others. Neo-Paganism is distinguished from other forms of Paganisms by the centrality of the belief that nature is sacred, and for this reason is often called an “earth religion” or “nature religion”. Neo-Paganism is an “earth-centered” religion. The “center” here refers to the place which is most sacred. This is often expressed in theological terms of immanence or pantheism. The difference between Neo-Paganism and other forms of contemporary Paganism is often a matter of degree. For example, while devotional polytheistic Pagans locate what is most sacred in deities — who may be thought of as a part of nature, Neo-Pagans locate what is most sacred in nature — of which deities may be a part. The earth-centered orientation of Neo-Paganism is something new, and was not usually characteristic of ancient paganisms. It is no coincidence that the birth of Neo-Paganism in the late 1960s and early 1970s coincided with the birth of the environmental movement. While many other religions, like Christianity and Buddhism, are becoming more ecological, no other non-indigenous religion has earth-centeredness as its first principle. Neo-Paganism can be distinguished from reconstructionist forms of Paganism, which attempt to reconstruct the religions of ancient pagans from surviving historical sources. Neo-Paganism draws freely from many traditions, both ancient and modern, without concern for historical authenticity, to create a spirituality to meet modern needs. In the words of Dennis Carpenter, Neo-Paganism is a “synthesis of historical inspiration and present-day creativity”. Neo-Paganism can also distinguished from devotional polytheistic forms of Paganism, which experience Pagan deities as literal beings with individual personalities. Neo-Pagans are more likely to understand gods and goddesses as metaphors for parts of nature and our unconscious selves and/or as aspects of a greater divine unity. Looks like my take on this has evolved over the years to a point where I find I’m in disagreement with you. While I may be using the descrptor phrase for myself currently as “Intentional Panentheist Polytheist NeoPagan,” rather than “Earth centered,” I’ve arrived (rightly or wrongly) at my own view of “life-forces of The Universe oriented” in focus. We may be limited to our own planet for the foreseeable future, but the rest of The Universe is indeed out there, and has been there all along. I thought it was worth mentioning – Most of the Afro-diasporic religions are actually monotheistic. The Oricha are not gods, they work in servive to the one god. Increasingly, many devotional polytheists don’t identify as pagan at all. That was one of several words used as an insult by Christians to refer to “ignorant” rural people following the local folk traditions.